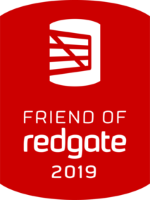 Bob Pusateri, our Solutions Architect and SQL Server MCM, has just been named Friend of Redgate for the sixth year in a row! If you’re not familiar with the Friends of Redgate program, associates work with the Redgate development and product teams to provide feedback on existing products, new tools, and feature enhancements. You can also find us doing things like speaking at events, writing articles on Redgate tools, and participating on the Redgate forums. Last year, Bob even got to present at SQL in the City Summit in Chicago as a result of being in this program. Redgate is a wonderful organization to be associated with. Not only do they make great tools and publish some very helpful books, but they’re also extremely community-oriented. They sponsor many functions such as user group meetings and SQL Saturdays, and also put on their own events, such as SQL in the City Streamed and SQL in the City Summit. Thank you so much, Redgate. Bob is certainly looking forward to another awesome year!